Takeaway: Beginner yogis will quickly start to feel the benefits of this short yet effective asana sequence. When it comes to yoga, sometimes it’s hard to know where to start—especially without some basic knowledge of the asanas (postures) and how to sequence them. When a friend first encouraged me to try yoga, I was reluctant. Why? I was nervous that I wouldn’t be able to stay in sync with the rest of the class or bend my body into shapes that resembled pretzels. I soon saw that no two yogis in the class had the same shapes, or the same practice for that matter. There were plenty of variations to each asana and everyone checked their judgment at the door. As a new yogi, I wanted to ease into it. After a few classes, I learned that it really didn’t take a lot to get started—just my body and an open mind. In time I found that my practice expanded naturally. Getting into the right flow is easier with some guidance. Here is a recommended basic sequence of seven asanas for beginners (and for yogis of all levels) to help you grow stronger with each practice. Sukhasana is far from easy. This is where the personal journey into the ancient practice of yoga all starts…. Clear the mind and warm up the body with some deep breaths. 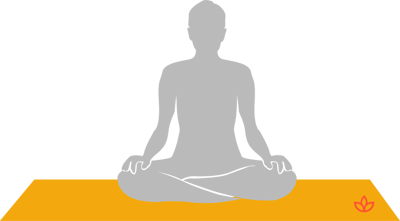 Come to a seated position on the mat with legs crossed. Ensure the spine is straight and the sit bones are pressed open. Finally, the palms can remain open for more energy. This posture was very difficult for me at first because my mind was always racing or thinking about what I had to do the minute I left the yoga class. Although sukhasana looks effortless, there’s a lot going on in the mind that helps the body release stress and tension. Cycling between these two opposing asanas is a wonderful vinyasa to stretch the spine and deepen the breath in order to help prepare it for standing postures. Come to the hands and knees to form a table top shape. Ensure the wrists and shoulders are stacked and the hips and knees are aligned to prevent injury. Arch the spine on an inhale, pressing the heart center to the ceiling and allowing the gaze to follow. Round the spine on an exhale, pressing the navel upwards. Cycle through this series eight to 10 times. From marjaryasana-bitilasana, touch the toes together and press the knees to opposite sides. Press the hips back over the heels and extend the arms in front. Breathe deeply with closed eyes. Roll the forehead on the mat to erase any tension. Balasana is a great posture to return to during any yoga practice if rest is required. From balasana, inhale onto all fours like in marjaryasana-bitilasana. On an exhale, curl the toes under to lift backward into adho mukha svanasana, pressing the hips to the ceiling. Plant the palms onto to mat, spread the fingers apart and breathe deeply. Pedal the heels up and down here to lengthen the calves and hamstrings. Stay here for 10 breaths. Walk the feet toward the hands. 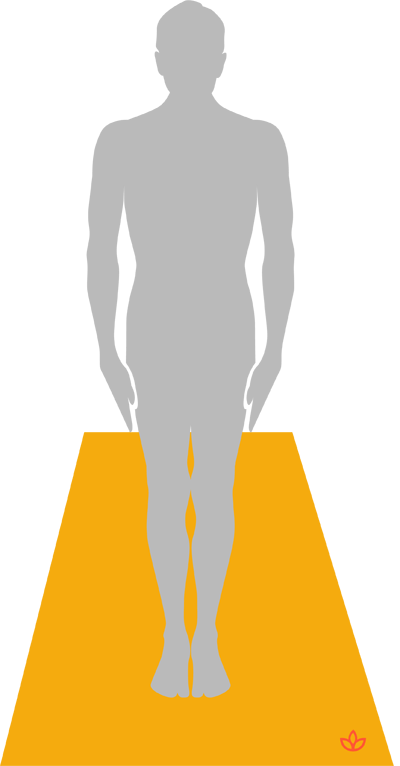 With the feet on the mat (either together or hip-width apart), inhale and reach the arms to the ceiling. Slowly bring the hands to anjali mudra (at the heart center) on the exhale. Relax the shoulders and open the chest. Seated postures help open the hips and increase flexibility, and I find these asanas very helpful in every practice. From tadasana, come to a seated position on the mat and lie back. Cross the right ankle over the top of the left knee to make a figure four shape. Loop the hands through the left thigh and inhale while pulling toward the heart. Breathe here for eight to 10 breaths before changing sides. This is the ideal way to seal a practice and reap the benefits for mind, body and soul, and that’s exactly what savasana does. From sucirandhrasana, spread both legs to the corners of the mat. Outstretch the arms to either side with palms facing up. Let stillness wash over the body and stay here for as long as possible. Practicing this sequence regularly will slowly guide anyone who is new to the practice into the wonderful world of yoga, just like it did for me. Over time, I found a difference in the way my body looked and felt—from increased strength and flexibility to general well-being.